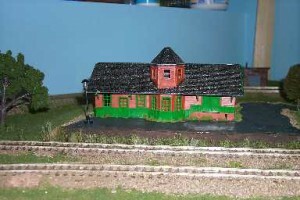 My first model railroad was the Nova Scotia Eastern Railway. It was a two-level around-the-walls layout built in an 8′ x 12′ room. The NSER was a fictional shortline that took over CN’s Dartmouth Subdivision in Nova Scotia, and interchanged with CN and the Windsor & Hantsport Railway at Windsor Junction. The Junction itself was a centerpiece of the railway. The NSER was never completed (are any model railroads actually finished?). In the end I had completed the lower level with track and scenery, and had track up to the upper level and had begun the Dartmouth yard. I had begun operating on the upper level to some extent but there was no scenery there. In my next post I’ll talk about how I designed the railway to achieve my “druthers”.